We’ve told the story of how St. Paul’s rector, William Ingraham Kip, proposed a chapel of ease for the parish, and how the first steps towards forming the Chapel of the Holy Innocents were taken 1848. But we’ve recently seen a letter (held in the archives of the New-York Historical Society) written by Kip that provides additional information about an earlier proposal. It details plans which were quite different both from those discussed in 1848 and from the independent Church of the Holy Innocents as it was incorporated in 1850. Kip’s letter, dated May 27, 1847, was addressed to Gulian Crommelin Verplanck, a vestryman of Trinity Church, Manhattan, the richest congregation in the Diocese of New York, which then included the state as far west as Utica. 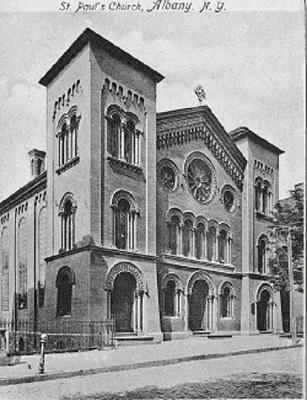 Trinity had provided financial aid to many struggling congregations across New York, including a $5,000 grant to St. Paul’s in 1833 that had kept the congregation afloat during a critical period. Importantly, Kip did not ask that Trinity Church directly fund the two new churches. Rather, he proposed that the grant be designated to pay off half of St. Paul’s outstanding debt, reducing the interest the congregation would have to pay, and speeding the repayment of the principal. To justify this proposal, Kip reminds Verplanck of St. Paul’s recent history. Kip probably chose Verplanck because he would have already known some of this history, having lived in Albany from 1820 until 1823 as a State Assemblyman, and then again from 1838 until 1841 as a member of the State Senate. St. Paul’s financial problems had started with its founding in 1827, culminating in 1839 with the forced sale of the Ferry Street building and the move to Pearl Street. The church could have simply reincorporated and walked away from the debt arising from the construction of the Ferry Street building. Instead, they chose to honor those debts as they began what Kip describes as their “new enterprise” in the former Pearl Street Theatre. The congregation had grown significantly since then, and the parish was stronger than it had ever been. But St. Paul’s was still burdened by $10,000 in debt, and reluctant to start new ventures while holding that debt. Halving the debt, and substantially reducing the interest payments, would encourage the congregation to respond to the city’s needs. Kip’s vision, then, was not of missions funded and supported from the outside, but of a vibrant St. Paul’s, no longer constrained by heavy debt, that would be allowed to create and support new outreach, to venture forth in mission. These new missions, he stressed, would be entirely St. Paul’s work, fully supported by the parish. The request was an urgent one, particularly because the two areas with greatest growth also had very few churches. In 1847, there was one Roman Catholic church in the North End (St. Joseph’s, in its original home on the corner of North Pearl and Livingston Avenue) and a Methodist Chapel in Arbor Hill (Arbor Hill Methodist). And Kip points out that John McCloskey, who had been appointed Albany’s first Catholic bishop a week earlier, was likely to plan moves into both of these areas. We do not have Verplanck’s response, but it must have been negative. Within the next year, Kip and his senior warden, William H. DeWitt, had begun plans to fund a single chapel of ease in the North End through subscriptions. Those plans also failed, and it was only through DeWitt’s donation of the land and the cost of construction that Holy Innocents came to be built. This, then, is the back-story of Holy Innocents. The passion of this letter, and Kip’s vision of St. Paul’s mission work explain Kip’s disappointment and anger when DeWitt formed Holy Innocents as a separate parish. Kip had seen the mission chapel as a vital outreach that would both enliven St. Paul’s and enhance the church’s cause in the city. But DeWitt’s creation of a separate parish had not only ruined that plan: Holy Innocent’s deed provided that DeWitt and his heirs would have the right to nominate the church’s rector in perpetuity, even over objections from the congregation. DeWitt’s vision of his own private, family chapel was the very antithesis of Kip’s plan. Kip (with the rectors of Albany’s Trinity Church and Grace Church) protested the consecration of Holy Innocents. The consecration had proceeded only when DeWitt agreed to change the objectionable terms in the church deed and Kip withdrew his protest. In our next post we will learn more about Holy Innocent’s after-story: how hard feelings between Kip and DeWitt lingered even after Kip withdrew his protest. This entry was posted in Free Chapels, Wm. Ingraham Kip on July 26, 2017 by Paul Nance.